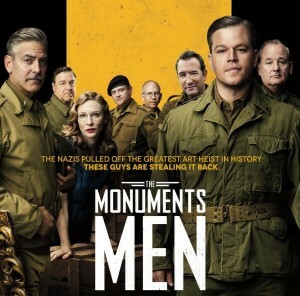 In the movie, the Monuments Men consisted of seven men from various fields in the art world; in reality, there were approximately 345 men and women who were assigned to the Monuments, Fine Arts and Archives (MFAA) program. The movie necessarily had to focus on a smaller number of people, but suggesting that merely seven people “saved” the treasures of Europe is misleading. I realize that having a small group of people allowed for greater interplay among the characters; but I felt that it was exactly this interplay that was one of the movie’s greatest flaws. George Clooney said that they wanted to “let these guys have some flaws and have some fun” (Entertainment Weekly, Aug. 23, 2013). Absolutely show the flaws of these men; but let them have fun? Theirs was not a “fun” mission; nothing about World War II was “fun.” Movies like The Great Dictator and Life is Beautiful successfully integrated humor with the horrors of the war through satire and social commentary. The attempts at humor in The Monuments Men are just awkward. For instance, what was the point of the episode where Matt Damon’s character accidentally stepped on an unexploded landmine? I wasn’t sure if it was supposed to be suspenseful/perilous or funny. Either way, it failed. Overall, I felt that most of the random, anecdotal moments that had little or nothing to do with the task at hand failed. By making these men a competent yet bungling, scholarly yet galumphing group, it at once disparaged their work and trivialized the Nazis’ crimes. Too much time was spent on these moments and not enough was spent on the tracking of looted art. A fully fleshed-out treatment of the ways the Monuments Men located art would have been more interesting than the glossed-over, cursory way it was handled in the movie. Because of this fatal flaw, the details and complexities of the recovery of confiscated property were overlooked – and it is the inclusion of these details that would have made a vastly more interesting film. For me, one obvious misstep was the handling of Rose Valland’s (“Claire Simone”) story. Valland’s main objective was to learn where the Jewish property confiscated by the ERR was being stored in Germany. In the movie she gives “James Granger” (based on James Rorimer and played by Matt Damon) the notebook in which she recorded this information. But the details of how she managed to compile this notebook were omitted: that her ability to understand German was unknown to the Nazis; that she memorized what details she could while working and then wrote them down once she got home; that she took the negatives of the Germans’ photographs of the looted art home overnight, had a friend print them, and then put them back in place by the next morning – including all of this would have not only been accurate, it would have made the movie more interesting. The movie would have also been more interesting if more details of the art looting and recovery operations were actually explained. Terms like ERR (Einsatzstab Reichsleiter Rosenberg) and OSS (Office of Strategic Services) are mentioned casually by the characters; I knew what they were talking about, but the average moviegoer probably would not. Perhaps it was thought that most people wouldn’t care about such details, but my guess is that the audience was comprised less of people who were drawn to the movie because of George Clooney and Matt Damon, and more of those interested in the subject matter who wanted to learn more. Explaining that the ERR was a Nazi agency tasked with confiscating Jewish property, and that the OSS, established to gather and analyze intelligence, included the Art Looting Investigation Unit, which investigated individuals suspected of engaging in art-looting activities, would have made for a more fulfilling – and not any less entertaining – viewing experience. The tonal problem is encapsulated in a comparison between the first and second trailers, which can be seen here. The tone of the first is much lighter, with “cool” music playing in the background; the second has dramatic, plodding movie-music. If the movie had actually been more melodramatic, it’s possible it would have worked better; sometimes lofty subject matter demands a grand, lofty movie. But unfortunately, the final tone of the movie was more in keeping with the first trailer: unsure of what it wants to be and at odds with its subject matter. Did they think that audiences would see the movie only if it were “funny?” I think people would have been interested in the subject even if it had been handled differently. There is nothing wrong with wanting big movie stars in your movie; but you can still have big movie stars in a weightier film. By underestimating their audience, the film’s creators underserved and failed to do justice to the immense potential of their raw material.